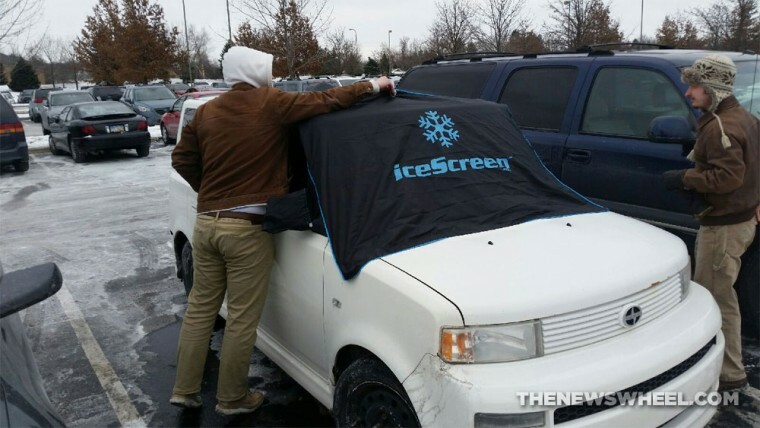 Does the iceScreen effectively protect your windshield from snow, or is it too much effort and forethought to use? The thing I hate most about living in Ohio (and believe me, there are several) is waking up to snow and ice, especially when I have to rush to work in the morning. Sure, I have remote start to warm up my car, but clearing my car of snow and ice in the cold—whether with a regular ice scraper or the unique Scrape-A-Round product—can be a real pain. 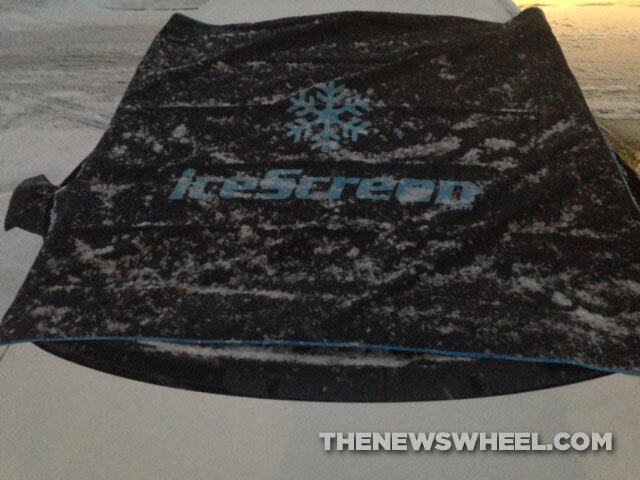 That’s why I was so excited about the iceScreen product when I heard about it a couple winters ago. I finally got the opportunity to try out the iceScreen on my own car just last week. 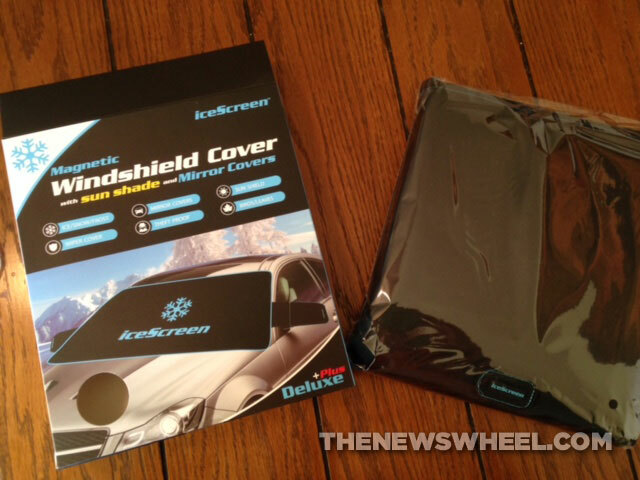 The specific product I was sent was the iceScreen Magnetic Windshield Cover with Sun Shade and Mirror Covers Deluxe Plus. I was also sent an XL Pickup version, but since I drive a Toyota Yaris and none of our staff drives pickup trucks, I wasn’t able to test that one. The purpose of the iceScreen is pretty simple. It covers your windshield (and possibly your side mirrors, depending on the product you select) to prevent snow and ice from building up overnight or while you spend a snowy day at work. Simply cover your windshield with the tarp-like product if inclement weather is approaching, and remove it later—snow and all—before driving (please do not drive with it on your windshield…). The major pitfall is that, obviously, it does not cover every window on your car. You still may have to scrape your back or side windows. The iceScreen also doubles as a sun shade in the summer to keep your car from getting too hot if parked in direct sunlight. 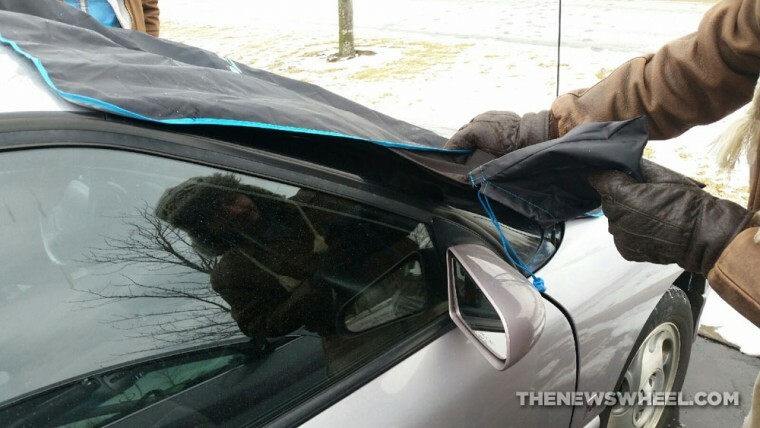 However, a regular sun shade is likely easier and faster to install every time you park, but if you already own the iceScreen, that saves you $10. The tarp-like fabric does not look particularly special upon first glance, but it holds up well to snow and ice, and is resistant to precipitation sticking to it. The Deluxe Plus version also upgrades the basic magnets to triple-strength, reinforced magnets. I can’t speak for iceScreen’s standard magnets, but the reinforced magnets held tightly throughout a very windy night of testing. I found the suction cups that were included with the product to be less beneficial than the magnets. They were harder to get to stick in the cold weather, but I understand their use in holding down the iceScreen, since the magnets are only located in the four corners and you might need adherence to a sunroof on the top. I would’ve preferred having more magnets included as well as suction cups, though. The mirror covers (“mittens”) proved especially beneficial. I somehow tend to neglect scraping my mirrors and don’t realize they are covered in snow/ice until I’m trying to merge onto the highway. So, this bonus feature keeps my forgetfulness from causing an accident. One frustration I had with the iceScreen was the “theft proof” feature, which doesn’t really deter theft. 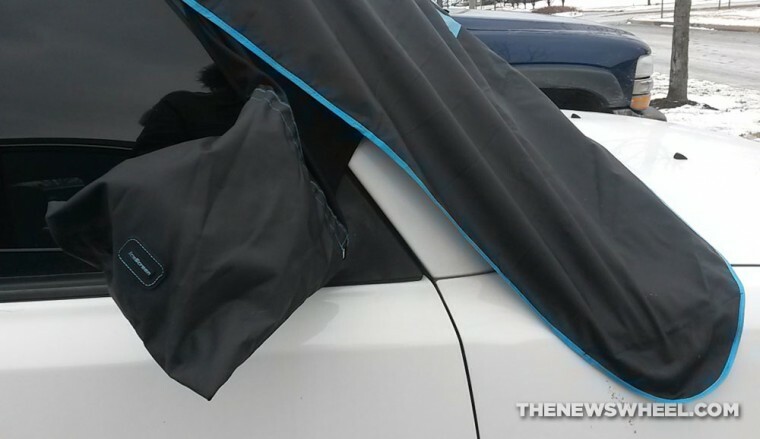 To prevent someone from removing the iceScreen from your windshield in the dead of night (which, quite rude), you can take the drawstrings attached to each of the mirror covers and tuck them into your car door. They have plastic balls on the end that would, in theory, get caught inside the door if someone tried to remove the strings. But if someone is that motivated to steal your iceScreen, I’m willing to bet they wouldn’t mind taking a knife or scissors and cutting through the weak strings. Then, they would be free to make off with the rest of the product. The Magnetic iceScreen windshield cover came with very limited instructions: one-fourth of a piece of computer paper, with printing on both sides. One side explains some of the extra features of the iceScreen (“sweat-proof your seats after work or gym,” which seems a bit reaching), while the more helpful side actually details the installation process. Installing the iceScreen is definitely a bit of a learning curve and is much easier with the help of a second person, especially in windy weather. The first time I put it on, I was by myself, in the dark on a windy, snowy night…and I struggled. However, now that I’ve learned the process, I can attach it to a car with little-to-no trouble, even by myself. Don’t let your first attempt discourage you! The main body of the product has four magnets, one in each corner of the trapezoidal tarp. These adhere to the four corners of your windshield, on the metal frame of your car. You can then slip the mittens over your side mirrors, tighten the drawstrings, and tuck them into your car doors. 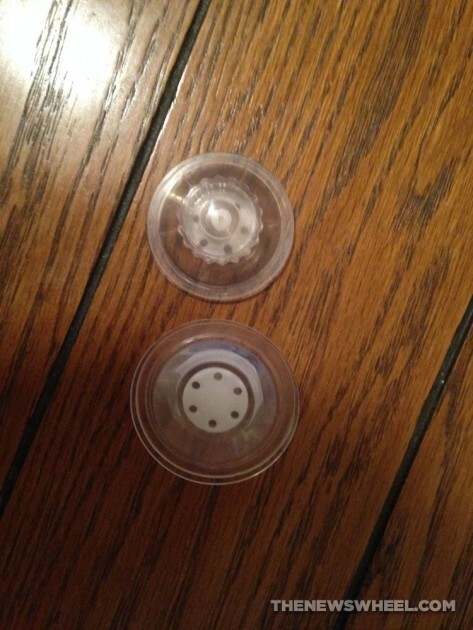 For extra adherence, you can use the two suction cups provided in the kit. Overall Assessment: Does It Do What It Advertises? The easy answer: yes, it does. The more complicated answer: yes, on the right vehicle. I found myself rather confused by the boxes that were sent to The News Wheel: one for XL Pickups, and the Deluxe Plus version I tested. The back of the Deluxe Plus box says its size is suitable for “coupes, SUVs, sedans, hybrids, and minivans,” but not intended for “pickup trucks, trucks, large vans, and micro cars.” As I mentioned before, I drive a Toyota Yaris, which I would not consider a micro car, but rather a compact hatchback. Yet, while the box that the Deluxe Plus is packaged in indicates that it works for coupes/sedans, the website says this version is made for mid-size luxury cars and SUVs only. Thus, what the box states should fit my vehicle was much too large. The poor fit on my Yaris was frustrating, to say the least. However, it still worked. The placement of the magnets was horrible for my car (it would have benefited from a magnet in the top-middle, because it was so over-sized that it would have easily connected to my car’s roof), but I don’t know if a middle magnet would have worked on a vehicle for whose size this version was actually designed. 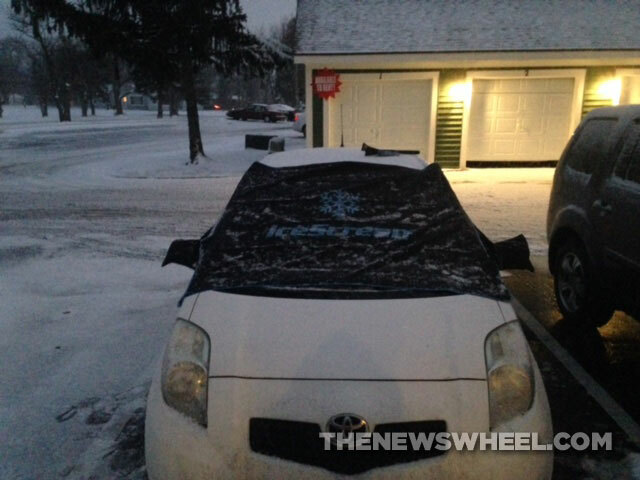 The iceScreen fit my Yaris so loosely that I was so sure it would blow off in the night, but it did not. And what’s more—it prevented snow and frost from covering my windshield in the morning. The sizing thing still bothered me, so we tried it out on a few coworkers’ cars. The iceScreen fit quite well on editor Sam’s 2014 Toyota Camry SE, decently on editor Rain’s 2005 Scion xB, and very terribly on editor Aaron’s 1995 Saturn SC-2 (his car didn’t have a wide enough A-Pillar for the magnets). The product site recommends fitting this version to a Honda CR-V, a Buick, a Lexus, a Chevy Equinox, a Jeep, and similar models. Bottom line: you’ll definitely want to pay attention to the sizing when ordering one online for ease of installation (and peace of mind overnight), but the cool thing is that it still worked for me even without a good size fit. One downside to the product is that it requires some forethought in the evening and setup work that may end up being unnecessary. Imagine forcing yourself to bundle up in the evening to go install the iceScreen only to find out that the weatherman was wrong in the morning, and there is no snow on the ground and thus no reason to have put on the iceScreen the night prior. I would definitely recommend this product for use, but I would likely only take the time and effort to put it on my car if I knew a snowstorm was imminent. Could the product be improved? Certainly. I think more strategically-placed magnets would be beneficial, although iceScreen’s website says some units include up to seven magnets (which mine did not). Plus, I think the theft prevention feature could be improved with cut-resistant material. But as it stands now, the iceScreen does exactly what it claims to do—and for many who hate having to clear their cars in the morning, it would be an absolute blessing. The iceScreen magnetic windshield cover is sold through the manufacturer’s website. Product provided for review by manufacturer.